New eBay Shop Pricing Structures – Let's Do Some Maths! One important point – the packaging voucher and listing upgrade credit are only given to those subscribed to either an Anchor shop or Featured shop (the two highest level shop subscriptions on eBay) and NOT to those with a Basic shop. From 30th March 2017 those are the new shop and listing fees – of course the biggest change is for non shop sellers, as you don’t have any benefits to counteract this price increase. And especially any sellers who relied on listing items as auctions with a starting price of £0.99, as the price of that has gone from 9p to 30p, a HUGE increase at more than three times higher! Thankfully there are no changes to the final value fees, as that would really be a big decision from eBay and will change the profitability of a lot of items and sellers! But before we start bashing on eBay too much, let’s stop for a second a do a little bit of maths (I’m sorry, I know it’s Monday!). Previously, a Basic shop cost £17.38 a month and for that you got 200 fixed price listings, which works out at a cost of 8.7p per listing. Now the price has been increased to £25, BUT you get 250 fixed price listings and 50 auction style listings, so the cost per listing is 8.3p… so really it’s not a price increase in that sense. Let’s quickly do the same calculation for the Featured shop subscription as well. So a similar story for that as well, where it’s actually marginally cheaper, IF you use your full listing allocation (and that also doesn’t take into account the packaging voucher and upgrade credit). Well the answer to that is actually very, very simple (the new fees have made it even easier to work out than before). Let’s look at it this way – a Basic shop is the lowest level shop subscription and it costs £25 a month. If you don’t have a shop subscription, i.e. you “pay as you sell”, then each listing will cost you 30p and that’s whether it’s a buy it now or auction style listing. So if you list 84 items in a month, it’s going to cost you 84 x £0.30 = £25.20 – MORE than what a shop subscription would cost you and for that you can have 300 listings, so it’s a no brainer. However, if you create 83 or less listings in a month, then paying the 30p pay as you sell listing fee would work out cheaper. See – I told you it was simple! And you can also apply a similar calculation to decide between a Basic and Featured Shop. A featured shop subscription costs £69 a month. 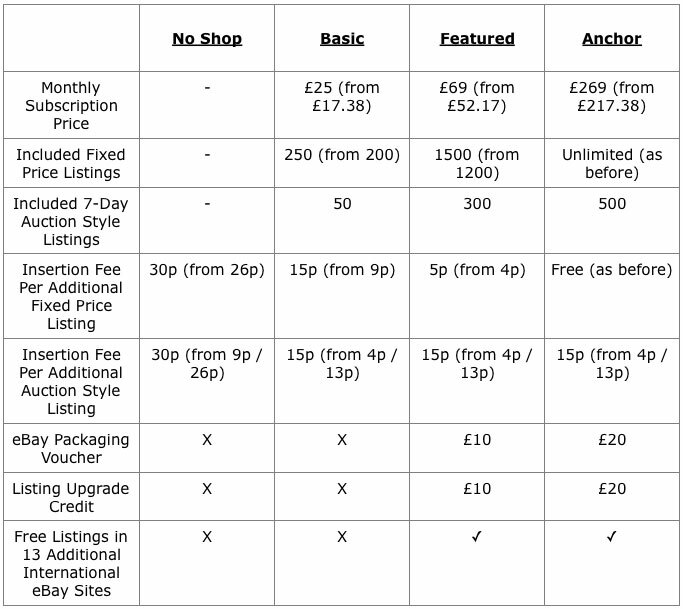 If you have a basic shop it will cost you £25 a month for 300 listings plus 15p per additional listing. That means that if you create 594 listings per month, it will cost you £25 + (£0.15 x 294) = £69.10 – MORE than what a featured shop subscription would cost you. If you create less listings than that each month then it would be cheaper to simply have a Basic shop subscription. Then beyond that, it’s very unlikely you’ll need an Anchor shop unless you’re a huge company creating thousands of listings per month. If you sell 83 items or less per month, then use PAY AS YOU SELL. 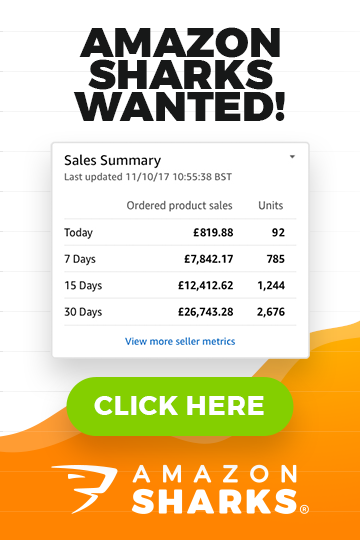 If you sell more than 83 but less than 594 items per month, then get a BASIC SHOP SUBSCRIPTION. If you sell more than 594 items per month, then get a FEATURED SHOP SUBSCRIPTION. BUT – like I said, this is only considering the fees you pay and doesn’t take into account some of the additional benefits and tools available to shop owners. Previously you were only able to use GTC (Good ‘Til Cancelled) listings if you had a shop and this was a HUGE reason to get one as, simply put, you need GTC listings if you’re serious about creating a real business on eBay. Especially if you want to get your listings to the top of eBay’s search results! It was because of this that I advised many people to get a shop, even if they didn’t necessarily need one due to their selling volume. However this is no longer the case as GTC listings are available to sellers without a shop! Sadly eBay are still restricting Promote Your Listing to shop owners only, so if that’s something you plan to use or something that you already use, then you’ll need to pay for at least the basic shop as well. And that about brings us to the end of today’s post. What do you think about these changes? For anyone who’s not using the full listing allocation, then these are a price increase… there’s no way to sugar coat that. 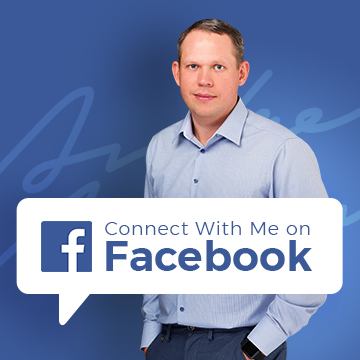 As always I’d love to hear your thoughts and opinions, so please feel free to comment below and I’ll personally reply to you within 24 hours, Monday to Friday. Otherwise, I’ll see you on Wednesday. We chatted earlier in the year re my concern re the New VAT rules that ebay would be implementing – in that chat you indicated the VAT adjustment would not effect me – well unfortunately it has big time. With the huge increase in anchor shop fees in March for a small business seller in ephemera these two increases are a hammer blow. Having gone from a featured shop in March my fees have soared out of proportion to the income I am currently earning. It does not seem right to me that I pay the same anchor shop fees as say a large retailer – it would be complicated for me to register for VAT and my selling prices reflect the market price – if I could get my listings up to 30000 items I might have a chance but that will take a long time as I can only list so many a day – I suppose I am stuffed! There appear to be few true competitors – I tried ebid but it was virtually dead – does ebay ever listen to sellers concerns. Yes, I was wrong on that and already corrected myself on the eBay VAT post. As for eBay not listening to sellers – eBay is a business and main goal for any business is to make money, as simple as that. If they can rise fees, they do it. eBay has no problems in attracting sellers – as you probably know, there are already way too many of them on the platform often selling exact same item. IF eBay fees is your biggest problem, something is fundamentally wrong with your business model Graham. You don’t have enough margin. I have previously bought your EAB for 2 years running. I have a question, i know if i have a basic shop all i have to do is offer postage to the countrys that i want to post to to show on international listings, however is it better to have a FEATURED shop so that i can in fact have my listing show up guaranteed in the search results of 13 different countrys? It depends on the number of listings – you can still list directly on other eBay/international marketplaces having a Basic shop OR you can open up Shops in regional marketplaces. Featured shop has them included BUT it cost £245 a month so you need to list A LOT to make it cost effective. The announcement of adding VAT to fees is a big hit – I am not VAT registered selling paper ephemera postcards banknotes etc. I can not add 20% to my prices nor can I absorb 20% in to my selling price. I upgraded to an Anchor shop three months ago because over a 3 year period I could increase my listing total by 2500 items per year but it will take me a long time to get up to 20000 items for sale all the time absorbing huge ebay fees plus VAT on selling fees too. I therefore am reverting to a featured shop which will restrict the number of items I can offer – 5p per listing on 10000 items would mean relisting fees would be £425 plus VAT every month. I would be willing to pay a higher selling fee rather than pay a fixed fee or a graduated fee on the number of items I have for sale then I would properly be able to measure my profit and costs. I am also thinking of reverting back to ebid which I have an account although I worry about their reach. I understand the legal reasons why VAT is now being charged but ebay have given no thought to how this will change the smaller ebay business seller. You have got it wrong, just like many other people it seems as I have received numerous emails about this recently. IF you’re NOT VAT registered, your eBay fees won’t change! Nothing changes for you!!! If you’re VAT registered, eBay would start to charge you VAT on fees BUT only because they start doing it with UK VAT number. Previously they used a legal entity outside the UK, hence fees were ex-VAT. Now, they will charge VAT but this is input VAT which you’ll offset against VAT you take in sales. So even for VAT registered people, fees WON’T INCREASE!!! Thanks for the advice very very helpful – I had the screen open and was about to revert to a featured shop but will now continue and try and get my listing numbers up. So basically because I do not have a VAT Number ie not registered I will not be charged VAT. The fees you have always paid already included VAT, so nothing changes for you. I have a just started basic shop subscription. I have just increased my stock to include 150 listings and last month sold over 1200 items. Do I need to be upgrading to a featured shop now? By the way, what a service you provide, 1st class! You don’t HAVE to upgrade to featured shop – it’s not mandatory. Cost wise – with 150 listings you’re better off staying with Basic Shop. Featured shop becomes cost effective when you have 600+ listings. Thanks for your response. So just to clear up, when you say that if you sell more than 83 items but less 594 ( basic shop) you are referring to listings and not individual items? The increase is definitely frustrating, I was wanting to move to the Featured shop level at some point next month, since with new stock I’ll ideally need 400-500 listings. Now there’s a choice between 250 listings or 1200 listings, putting me in the awkward mid-point between the two shop levels, facing a flat-out fee increase, and the extra auction listings aren’t useful in my niche. It may be worthwhile if the packaging voucher was useful, but it isn’t, the store has no small boxes, bubble wrap is about the only useful thing in there (especially since you can’t save up vouchers, £10 month has to be spent within the month). As an aside I do wonder how many ebay sellers are now going to be dabbling in reselling packaging that they spent their ebay voucher on.. not a good time to be a bubblewrap seller! I’m considering limiting ebay to 250 items (low ticket, fast sellers) and spending the £44 that would have been spent on upgrading to featured shop elsewhere (webstore, google adwords etc.) simply because there isn’t a store tier that works for me. Anxious about paypal fees possibly rising to 4.4% as well, so there’s a lot of factors in play currently that are pushing me away from ebay/paypal. Thanks for your comment (and feel your pain on being in the middle of two plans). Any source/info on potential PayPal rise to 4.4%? That sounds incredibly high, considering card processors now are so competitive that you can easily get account with fees less than 3%, even without huge volumes.